Yahoo! Messenger for iPhone & iPod Touch application is now available for download on iTunes App Store. 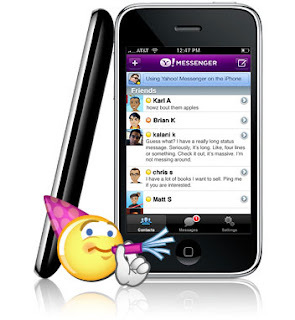 Instant message: Send text messages back and forth with your friends, including emoticons and web links. Photo sharing: Take a photo on your iPhone and send that, or grab one from your photo gallery to share. Stealth settings: Sign in as invisible, or change your status to invisible once you’re in the app. Custom status message: Enter a custom status message for your friends to see. You can even include a web link with it. Recent conversations archive: Under Messages, tap a contact and you’ll see your most recent conversation. You can type in a message from there to start chatting again. Special idle state: If you have to leave the app for whatever reason, like a call comes in or you click a link in an IM that takes you to Safari, the Yahoo! Messenger for iPhone app will keep you signed in but change your status to idle. That way you can continue to receive messages and provided you return to the app within ten minutes, pick up where you left off. Additional settings: Tap the Settings icon to change the sort order of your contact list, or to show or hide offline contacts in your list.